Here are some wonderful cars to fall in love with this Valentine’s Day. They are just a few from a selection of iconic and rare vintages from the acclaimed O’Flaherty Mercedes-Benz Classic Collection. The collection goes on public view in the recently redeveloped showrooms of MSL Ballsbridge Motors on Dublin’s Shelbourne Road from tomorrow. As a tribute to company founder, the late Stephen O’Flaherty and to his eldest sons, Michael and Nigel, it was decided that the public would get the chance to see these wonderful models in the metal for the first time. And people are in for a treat, if my memories of the collection is anything to go by. The good thing is that you can take your time because the treat will be stretched out over the rest of the year. That’s because the cars will be displayed on a rotational basis throughout 2019 for periods of four weeks each. So as one goes, it will be replaced by another. That way it should be possible to see them all at your leisure. I think it’s a lovely idea and a great opportunity to see the handiwork and ingenuity of people from so long ago. The main attractions for the initial launch of the rolling exhibition will be what are being described as the “two most prized models in the O’Flaherty Mercedes-Benz Classic Collection”. There is a limited-edition working replica of Karl Benz’s famed 1886 Benz Patent Motor Car, which as you may know was the world’s first passenger car. And there will be a 1898 Benz Velo Comfortable – the first motor car that was imported into Ireland (now that’s what you call history). 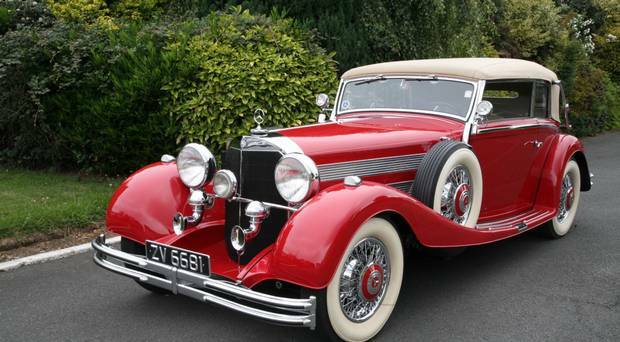 ‘Must-see’ models that will appear through the year will be a rare 1911 vintage Benz model 8/18, the imposing 1935 Mercedes-Benz 200 two-door sports-roadster, a 1936 500 K Cabriolet and a two-door 1955 300 SL Gullwing with its distinctive upwards-lifting doors. It sounds like a veritable feast. Adding to the sense of occasion is the fact that the location has its own place in Irish motoring history: the first Volkswagen Beetle built outside Germany was assembled there in 1950.